Go to original pattern for design DROPS 180-35. The set consists of: Knitted hat with garter stitch and wrist warmers. The set is worked in DROPS Alpaca. For the whole set, there will be enough yarn with approx. 150 g in both sizes in DROPS Alpaca. 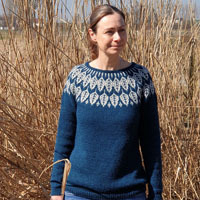 "Alternative yarn (Yarn group A)" – see the link below. 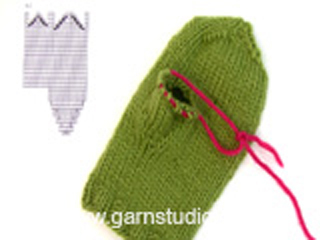 DROPS NEEDLES SIZE 3 MM – or the size needed to get 24 stitches and 48 rows garter stitch on 10 cm in width and 10 cm in height. DROPS NEEDLES SIZE 2.5 MM for rib – or the size needed to get 26 stitches and 34 rows stocking stitch on 10 cm in width and 10 cm in height. DROPS DOUBLE POINTED NEEDLES SIZE 3 MM – or the size needed to get 24 stitches and 32 rows stocking stitch on 10 cm in width and 10 cm in height. DROPS DOUBLE POINTED NEEDLES SIZE 2.5 MM for rib – or the size needed to get 26 stitches and 34 rows stocking stitch on 10 cm in width and 10 cm in height. All increases are made from the right side! 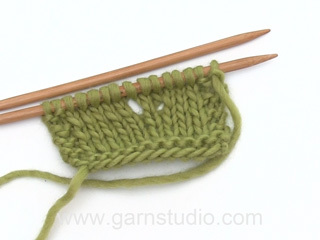 Increase 1 stitch by making 1 yarn over, on the next round/row knit the yarn overs twisted to prevent holes. All decreases are made from the right side! Decrease 1 stitch after the marker thread as follows: Knit 2 together. The piece is worked back and forth on the needle and is sewn together mid back to finish. Loosely cast on 122-142 stitches (including 1 edge stitch in each side) with needle size 2.5 mm and Alpaca. Purl 1 row from the wrong side, then work rib (= knit 2/ purl 2) with 1 edge stitch in GARTER STITCH – see description above, in each side. When the piece measures 6 cm, change to needle size 3 mm and insert 5 marker threads in the piece from the right side as follows: Insert 1 marker thread after 1 stitch, the next 4 are inserted with 24-28 stitches between them, after the last marker thread, there are 25-29 stitches. Now continue working in garter stitch. On the next row from the right side, increase 1 stitch after all the marker threads (= 5 stitches increased) – read INCREASE TIP! REMEMBER THE KNITTING TENSION! Increase in this way every 2nd row 3 more times and then every 4th row a total of 7 times = 177-197 stitches. When the piece measures 11-12 cm from the rib decrease 1 stitch after each marker thread on the next row from the right side (= 5 stitches decreased) – read DECREASE TIP! Decrease in this way every 2nd row a total of 17-19 times = 92-102 stitches. Work all stitches together 2 and 2 on each row from the right side a total of 3 times = 12-13 stitches. The hat measures approx. 25-26 cm. Pull 1 thread through the remaining stitches and pull tight. Sew the hat together mid back inside 1 edge stitch. The piece is worked in the round with double pointed needles. Cast on 65-70 stitches with double pointed needles size 2.5 mm and Alpaca. Knit 1 round. Then work rib (= knit 2/ purl 3). After 4 rounds rib, decrease all purl 3 to purl 2 by purling together the 2 first stitches in every purl section = 52-56 stitches. Continue rib with knit 2/purl 2 until the piece measures 5-6 cm. Knit 1 round where you decrease 7-11 stitches evenly on round = 45 stitches. 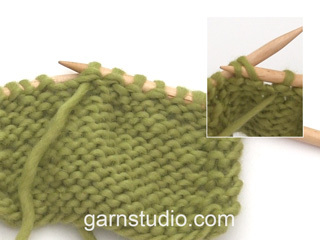 Change to double pointed needles size 3 mm and work stocking stitch. REMEMBER THE KNITTING TENSION! When the piece measures 14 cm start increasing to thumb gusset. Increase 1 stitch on each side of the next to last stitch on the round (i.e. on the inside of the hand) – READ INCREASE TIP! Increase in this way on each side of the increased stitches every 3rd round a total of 6-7 times = 13-15 thumb stitches and 57-59 stitches in total. When the piece measures 19-20 cm place the thumb stitches + 1 stitch on each side of these on 1 thread (= 15-17 stitches on the thread). Cast on 3 new stitches behind the thumb on the next round = 45 stitches on the needle. When the piece measures 23-24 cm, increase 11-15 stitches evenly on the next round = 56-60 stitches. Change to double pointed needles size 2.5 mm. Work 8 rounds rib in the round (= knit 1/ purl 1). Cast off with knit over knit and purl over purl. The wrist warmer measures approx. 25-26 cm. The piece is worked in the round. Place the stitches from the thread back on double pointed needles size 3 mm and, in addition, knit up 5-7 stitches in the edge at the back of the thumb stitches = 20-24 stitches on the needle. Work 3 rounds stocking stitch. 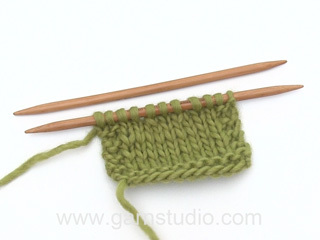 Change to double pointed needles size 2.5 mm and work 6 rounds rib (= knit 1/ purl 1). Cast off with knit over knit and purl over purl. Work as for right, but increase for thumb on each side of the second stitch on the round (instead of the next to last). Bonjour Frisotti, on mesure ces 11-12 cm à partir du début point mousse (= après les côtes), pas à partir du rang de montage. Bon tricot! Bonjour ! Pouvez-vous m’expliquer cette partie de la mitaine ? Tricoter 1 tour endroit en diminuant 7-11 mailles à intervalles réguliers = 45 mailles. Je ne comprends pas comment je dois l’exécuter. Merci ! Bonjour Mme Allard, vous tricotez un tour sur les 52-56 mailles et en même temps, tricotez 2 m ens à l'end à intervalles réguliers un total de 7-11 fois - cette leçon explique comment placer les diminutions. Bon tricot! What is the best bind off method for the gloves?I've started a normal bind off but I'm worried it will be too tight. Hi Maryanne, If your binding off is too tight, you can use a size larger needle to bind off or make 1 yarn over regularly while binding off. The yarn overs are bound off as normal stitches. Happy knitting! 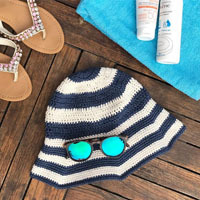 Hi Janice, You knit 2 stitches together, then knit 2 stitches together and so on to the end of the round and do this for 3 rounds. You are then left with 12-13 stitches depending on the size you are working. The measurements are from the cast-on edge to where you have worked so far. Happy knitting! Det går inte att skriva ut mönstret DROPS Serenity 180-35 på svenska. Det kommer inte med någon beskrivning, bara bild och info. Bonjour Mme Screve, on augmente d'abord dans la partie point mousse pour créer la forme du béret puis on va diminuer. En cas de doute, n'hésitez pas à montrer votre ouvrage à votre magasin (même par mail), un visuel leur permettra de vous aider. Bon tricot! Witam. Czapeczka zrobiona, ale mam dylemat z mitenką-z opisu wynika, że po zrobieniu 14 cm należy dodawać na kciuk po jednym oczku z każdej strony. 6 razy co 3 okrążenie. 6 razy dwa oczka daje mi 12 oczek. W opisie jest, że 13. Skąd to trzynaste oczko? Witaj Ireno! Na klinek kciuka dodajemy po 1 oczku z obu stron przedostatniego oczka w okrążeniu (mamy 3 oczka klinka). Dalej dodajemy oczka z obu stron dodanych oczek i powtarzamy dodawanie oczek jeszcze 6 razy. Na koniec mamy 12 dodanych oczek + 1 oczko na środku (przedostatnie oczko w okr. )= 13 oczek. Powodzenia! Buongiorno Barbara. Abbiamo corretto il testo. Dopo aver aumentato la prima volta, deve aumentare ogni 2 ferri altre 3 volte e poi ogni 4 ferri per un totale di 7 volte (quindi in tutto aumenta 11 volte per un totale di 55 maglie in più). Buon lavoro! 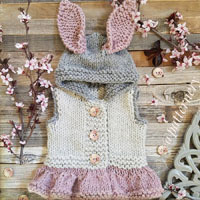 Me encantan todos los tejidos pero este en especial me gusta para mi hija.